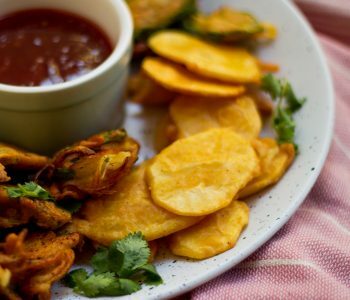 This simple recipe will take you back to the Desi chicken patties you used to get from the corner bakery. 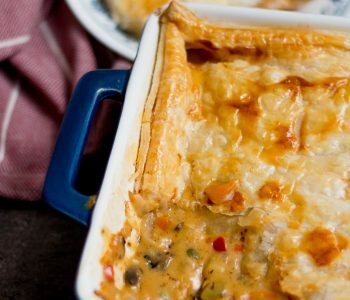 Crisp & flaky puff golden pastry filled with shredded chicken in a creamy white sauce. Fresh from the bakery oven, these Desi chicken patties were (still are) one of my favorite childhood snacks. Crispy puff pastry that kept on flaking with every bite, the ‘milky’ chicken filling and the top circle of puff pastry that we would eat plain or dip in tea. 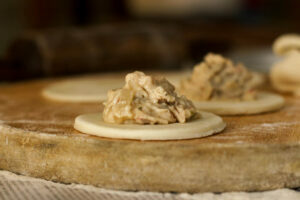 The round ones were always stuffed with chicken, and the triangle ones were usually stuffed with potatoes/vegetables. Unfortunately, concerns of hygiene have limited my intake of chicken patties. Though they are available at bakeries where I can be assured that the quality is maintained, those ones just don’t have that typical Pakistani bakery taste. The only ones that I do eat (when I pass by the area) are Crispo. 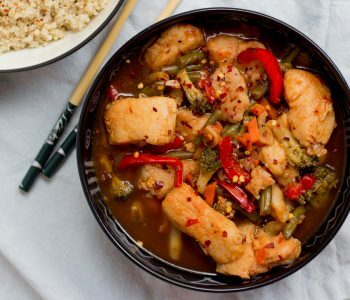 Crispy & flaky filled to the brim with this spicy chicken mixture. Absolutely the best chicken patties in town. Plus they do away with the top layer so you are saved from getting all the pastry crumbs on your dress. The difficulty in finding a hygenic chicken patties from outside is what prompted me to think about making it at home. Plus I have this chef friend of mine who shared pictures of chicken patties that she made at home which spurred me into action. She’s one of those rare individuals who is always to share recipes to help out others – have taken her recipe as in inspiration and then added my own twists. The trick to making delicious chicken patties is the white sauce – it’s what binds the shredded chicken together and gives it that characteristic bakery flavor that we all love. Start with rolling the puff pastry. Make sure you use a proper board or a rolling sheet. Sprinkle lots of flour. Don’t let the puff pastry stick to the board. Use a steel cutter to cut out circles or just use a glass if you can’t find anything. Spoon some filling in the middle. Be generous but make sure it doesn’t spread too much. 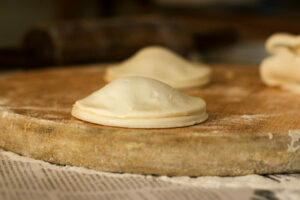 Apply egg wash at the edges and close with another puff pastry circle. Leave as is or use a fork to create a design around the edges. Keep the pretty ones for the guests and the rest for yourself. Apply some egg wash and bake in the oven. Make a cup of tea, sit in the sun and enjoy crispy, flaky chicken patties. Repeat till you run out of chicken patties. You will never look at store-bought chicken patties the same after you have had these. Puff pastry is now easily available at supermarkets across Pakistan, or can be ordered from bakeries in advance. For instance, Ideal Bakery & French Bakery. I personally use the puff pastry from the Tee-Emm mart bakery and have found it to be the best. Additionally, you can get puff pastry blocks at supermarkets. One brand that I have also tried is RR’s Puff Pastry available at Aghas, Ebco, Springs, Hydri Mart, Milestones and Greens. Click HERE for my Ramadan meal planner and sample menu guideline for iftar, sehri and dinner. Click HERE for tips on how to prepare for Ramadan and eat healthy in the month. If you are looking for recipes, all the Ramadan recipes on my blog can be found HERE. Keep checking back regularly as I plan to add more recipes soon. Heat oil in a pan and sauté garlic and ginger paste for a minute. Add chicken, spices and vinegar. Cook on high heat till chicken changes color. Turn heat to low, add water and cook the chicken till it’s tender and water has evaporated. Let the chicken cool and then shred by hand or in a food processor. Heat butter and oil in a medium sauce pan. Sauté sliced garlic till light golden and then onions till translucent. Add flour while whisking and cook for about a minute till the raw flour taste is gone. Add ¾th cup milk, chicken cube, black pepper, salt, chili flakes & Italian herbs. Keep whisking for 2-3 minutes till mixture is thick and no lumps remain. Defrost puff pastry block in the fridge. 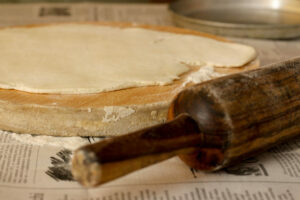 Cut a rectangle from your puff pastry block and roll it out. Sprinkle flour on the surface and on the top of the pastry sheet so it becomes easy to roll. Grease a baking sheet with oil and keep aside, or line a baking sheet with parchment / baking paper. 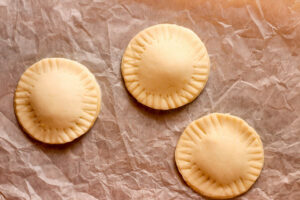 Cut out pastry rounds using a cookie cutter or use a steel glass if not available. Put one teaspoon of filling in the middle. Brush egg at the edges and then cover with another pastry round. Make sure it’s closed from the edges and crimp with a fork if you want. Repeat with remaining patties. If you are baking right away then brush patties with lightly beaten egg, otherwise the chicken patties can be kept in the freezer. 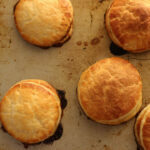 Bake at 200 C for 35 – 40 minutes or until patties turn light golden brown. Please note the temperature and timing of baking the puff pastry depends on the brand used. The brands available in Pakistan take about 30 minutes to bake, but other brands abroad will take less time. The chicken patties can also be kept in the freezer. 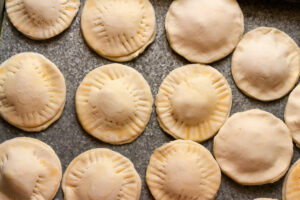 Line the prepared patties on a baking sheet ½ inch apart from one another and freeze for about an hour till they harden. Transfer to a zip-lock bag and store in the freezer till ready to bake. The chicken recipe is a basic recipe that I use for cooking chicken for any kind of filling or topping. For e.g. if I want to use chicken in sandwiches or pasta, as a topping for pizza or to add in a casserole. Double it and use the remaining chicken in other recipes. If you are using puff pastry sheets, then you just need to defrost and cut into circles as they are already rolled thinly enough. In order to save the re-rolling time make puff pastry triangles or squares using the same method and filling. 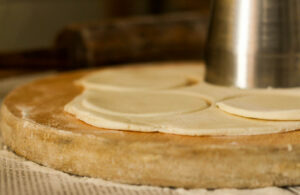 Make sure you roll out puff pastry in a cool place in the kitchen as it can become difficult to manage when warm. Either roll in a cool place or make chicken patties when the oven & stoves are not in use. We used to love the bakery chicken patties we bought regularly in karachi.